In an effort to create a nimble and responsive supply chain, Ruffwear has achieved a 30-day manufacturing lead time (from purchase order to leaving the factory) on its best-selling product, the Front Range® Harness. Yet even with fewer harnesses in the warehouse, the company has been able to reliably supply customers on demand. “We understand that the retail landscape is changing and brick and mortar stores need to be more creative and nimble. By getting rid of the antiquated pre-season ordering system and allowing retailers to make smaller, more frequent orders, they can more quickly react to consumer trends." By leveraging long-term relationships with vendors and manufacturers, and investing its own dollars and time into the newly developed system, Ruffwear, the leader in performance dog gear, says it has reduced waste and improved cash flow by shrinking the amount of inventory it keeps on hand at any moment by 50 percent. Reduces the outdoor industry standard time of 90+ days from purchase order to leaving the factory. Financially easier on retailers because of the high in-stock level. Financially easier for the manufacturer as it requires less cash to support the order cycle and growth. Shortens duration of potential product out-of-stock time if demand gets too high because of more frequent orders with shorter lead times. Minimizes waste of materials because you’re not guessing on colors/sizes/#’s. Ordering just what you need when you need it. Minimizes storage of materials and save on manpower that would be managing the storage, ordering from multiple vendors, etc. Minimizes quality risk by having manufacturing process flow from beginning to end. More accurate cost data of manufacturing. Easier to manage end-of-life product cycle. Ruffwear’s first product to successfully achieve a 30-day manufacturing lead time was the top-selling Front Range® Harness. In December, Ruffwear initiated a commitment with a second factory for all collars and leashes. The brand’s goal is to integrate the 30-day manufacturing lead time for all viable products. Ruffwear's mission is to build performance dog gear to enhance and inspire exploration for outdoor adventurers and their human companions. For more than 20 years, Ruffwear Performance Dog Gear™ has combined technology, quality, fit, function, and safety to facilitate its belief that every dog is an explorer. 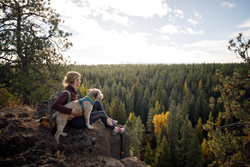 Based in Bend, Oregon, Ruffwear sells its products through specialty pet and outdoor retailers as well as at http://www.ruffwear.com. For more info, please contact Kate Ketschek, kate(at)revolutionhousemedia(dot)com or 603-828-1050.